This plug-in recolors the image using colors from the active palette that you choose in Dialogs → Palettes. It maps the contents of the specified drawable (layer, selection...) with the active palette. It calculates luminosity of each pixel and replaces the pixel by the palette sample at the corresponding index. A complete black pixel becomes the lowest palette entry, and complete white becomes the highest. Works on both Grayscale and RGB image with/without alpha channel. 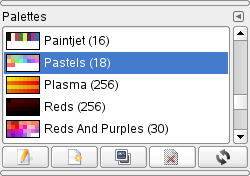 You can access this filter in the image window menu under Colors → Map → Palette Map. The colors of the active palette are applied to a black to white gradient. The color with the lowest index in the palette (orange) replaces the black color in the gradient. The color with the highest index in the palette (red) replaces the white color in the gradient. The other colors spread out in the order of the palette.